The rules of English grammar are easy to learn if you put time and effort into it. This intermediate level English grammar course will teach you the different forms of the English Present tense. You will learn how certain words in the Present tense are used to talk about possessions and personal attributes. You will also learn how to use the Present tense for negative and contracted forms, for scheduled events and ideas, and for actions. First, you will learn the proper use of the verbs 'has' and 'have' in the English Present Tense, which will help you easily describe a noun such as 'The zebra has stripes'. 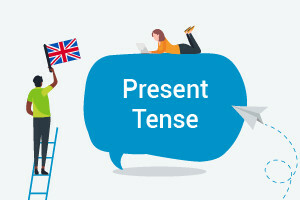 You will also learn about the Present perfect tense to help you say something about the present time with reference to actions in the past such as 'She has finished her homework yesterday'. You will then learn the use of have/has + got to talk about possessions or personal attributes, scheduled events or illnesses, and ideas. You will then study the Present Continuous tense so you can talk about an action that is happening or has started happening at the time of speaking but is not yet done. The course will also teach you how to use 'Do' and 'Does' to forms English questions and negative sentences. You will then learn how to use the Present Simple tense to say how often you do things such as 'I drink 2 cups of coffee every morning'. Learning about the Present Tense and its different forms is essential for all English learners, because it is the biggest part of talking about your everyday actions. It will also help you talk about current events and ideas, which is a great way to start a conversation and keep it going. So, if you are ready to take your English skills to the next level, check out this free online English grammar course today. Define verbs and be able to provide examples in singular and in plural. List nouns in sentences using the Present perfect tense. Explain how 'have/has + got' is used to talk about possessions or personal attributes. Describe how 'am/is/are + -ing' is used in the Present continuous. Define how we use the Present continuous for actions that are not happening at the time of speaking. List verbs that are used in the Present continuous to talk about changes happening around now. Explain how 'I do' in Present simple is used to describe a state or habit. Describe how verbs can change depending on the pronouns that are used.